Wilder, KY—Taking a 1930’s building and combining it with owners who are passionate about brewing great beer, are the keys to success for another Furlong-built beer brewing project, this time in Cincinnati’s west side. The 12,000-sq. 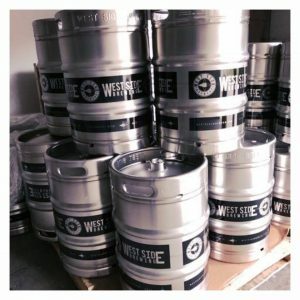 ft. West Side Brewing will be opening on Harrison Avenue across from the Westwood Town Hall in Westwood next April, 2017. Formerly the Wullenweber Motors Company building in Cincinnati’s west side, the building is undergoing a $1.3 million renovation and will soon become a vibrant, community destination with a wide variety of beer brewed onsite, offering something for everyone’s palate. West Side Brewing owner, Joe Mumper describes the new project as, “A gathering place for the community, offering a minimum of 12 beers that will suit everyone’s tastes.” Mumper hopes their location in the heart of Westwood will become part of the fabric of the neighborhood, continuing the great Cincinnati tradition of locally-crafted beer. West Side Brewery owners include Joe Mumper, Brian Willett, Kurtis Remmel and Jim Remmel. The project architect is Tyler Watkins of Work Architecture & Design. Located at 3044 Harrison Avenue in Westwood, the project will include two taprooms allowing for an inside look at the beer-making process and for large and private parties to have some separate areas. Plans are to include weekly entertainment, live music, a menu of small bites and onsite food trucks. The partners are this week launching a Kickstarter campaign to help fund some of the features and to include ideas coming from the investors. Information can be found at: https://www.kickstarter.com/projects/1586083921/west-side-brewing-cincinnati-be-a-backer. Furlong specializes in design-build construction, additions and renovations for commercial, industrial, office, medical and retail projects. The company currently has thirteen employees and was awarded the Tri-State Success Award by Cincy Magazine for the second year in a row. The company was named to the Business Courier’s Fast 55 list of the region’s fastest growing companies in 2013, 2015 and again in 2016, and has been named to the Northern Kentucky Chamber of Commerce Emerging 30 list of growing companies in 2014 and in 2016. Services are provided throughout the Tri-State and Midwest Region including Ohio, Kentucky, Indiana, Michigan and Tennessee. For more information, visit www.FurlongBuilding.com or call 859-647-2999.